William Haloupek, Far-called. Smashwords, 2011. 75k words. ISBN 978-1-4660-2935-4. $3.99. 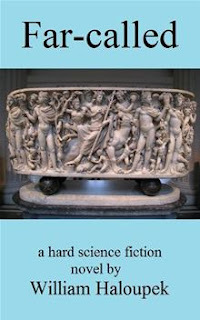 Far-Called by William Haloupek is a hard science fiction novel that pursues so many ‘what-if’ questions that it is as much just pure ‘speculative fiction’ as it is a hard scifi. This blend is what makes this book stand out. If you’re a fan of questioning society and ‘what would happen if’ scenarios, all of which are founded in a great deal of science and research, this is very likely a book that you will enjoy. This is the story of Matej, a man with a very special ability. He can remember numbers and letters, words and facts, with a memory that goes beyond the photographic. It is this talent that propels our intrepid professor into an adventure better left to folks like Indiana Jones and James Bond. Things go from bad to worse in a twisting and complicated series of events that put the lives of 400 million at risk. To give credit where credit is due, Matej does well enough for someone who wasn’t born with the innate awesome of Indiana Jones or James Bond. For those who are used to softer, lighter science fiction, be prepared to have to take this book in small doses. It sticks to hard science fiction with the same adhesive strength of duct tape and super glue. Depending on your stance, this is either a good thing or a bad thing. Almost the entire first half of the book deals with the social consequences of the exploration of space, the evolution of the human race, the recording of people, and just about everything except religion. Curiously enough, religion is practically non-existent in this novel, which is an interesting way to consider how the human race might change with the development of technology and the expansion of colonies throughout the universe. If political sciences aren’t your forte, your eyes are going to glaze over after the first three or four chapters. There is a lot of information, and much of it is presented in that dry, hard science fiction way that turns many off to the genre in the first place. I enjoy a good hard science fiction every now and again, but in truth, it took me a long time to get through this book. There is the expectation that you under political sciences, hard-core sciences, and all of those little tidbits that hard science fiction fans already know. Those looking for a mild introduction to hard science fiction should pursue a different book, because this one doesn’t pull many punches in regards to how hard science fictions are presented. With that said and out of the way, there are many moments in this novel that are positively brilliant. How society is tracked, how society has changed, how languages have evolved (and de-evolved) and how cultures have changed, all find their way into this book in a rollercoaster ride of ‘what if’ scenarios that can as easily enthrall as it can overwhelm. When the action starts up—about halfway through the book—we start seeing these concepts applied in how the characters react and make choices, which make it worth having read through all of that build up on the societies of the galaxy. As our character is a regular Joe with a special gift, it is all the more enjoyable as he risks life and limb for a cause that is noble and for the better good of everyone. The problem I had with this book is something I struggle with in almost every hard science fiction I get a hold of: I felt that the characters were not nearly as deep as they could have been. The character development and depth that is found in soft science fictions (or even fantasy novels) just didn’t translate well to this novel. While Matej is ever-present, he is often lost in the theory and the pursuit of how and why society changed as it did. In a way, this book reminds me of a history that has sections of action and adventure. The action, adventure, and moments where the characters stand out are really entertaining, but, just as the author warns at the front of the book, the focus is very much on the sciences. At least if you do decide to stick with this title, you will inevitably learn something. That is something that was rewarding about sticking with this book. It was a hard read for me, but at least I walked away with some new insights, fiction that was grounded in fact, and enough fiction to make someone seeking speculation quite pleased. While Far-Called wasn’t one of my favorite hard science fictions, I think it will definitely appeal to those who have more interest in political science, social science, and hard science compared to action, adventure, and all of the elements of a space opera. There is just enough action and adventure that it is rewarding for those of us who do really love a good space-based brawl with lots of explosives.